At her request: a ‘big’ sister who could hold her little brother. 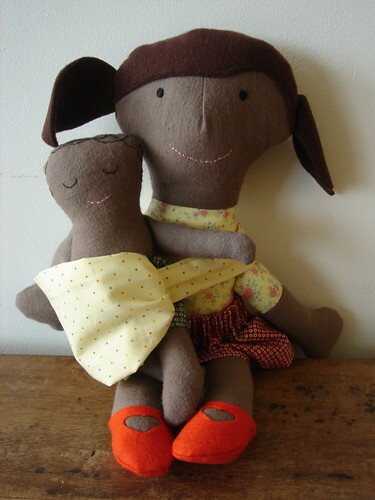 I made a dollsize baby-sling so the girl can carry her little baby-brother around. But you can play with them separately of course. We are having a lazy sunday, happy to have our son and brother back home. Outside it’s raining, inside the kids are playing and being creative. De zoon en broer is moe maar blij terug thuis gekomen. Buiten regent en waait het, maar in huis is het rustig. And I? I am searching for a good combination blue, red, pink. 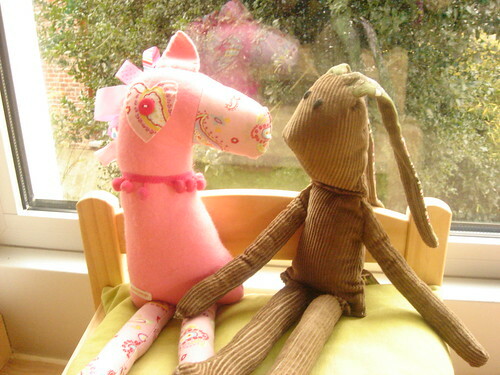 Because those are the favourite colous of my swap-partner of the Easter swap I joined in! En ik zoek een mooie combinatie blauw, rood en roos uit voor mijn ruil-partner van de paashaas-ruil waar ik me voor ingeschreven heb! I love to read the blog of monkeemaker, and my son does too! He is the one who wanted me to knit him a monkey. But I think – actually I hope – he forgot he asked me. Because now the monkey is finished (after weeks and weeks of knitting in the train off to work, knitting during lunch break, and that’s because your knitting projects you can take wherever you go, although I should need a better knitting bag..). Anyway, he is finished just in time, because my son is leaving tomorrow on a school trip for 5 days. 5 DAYS LONG!! 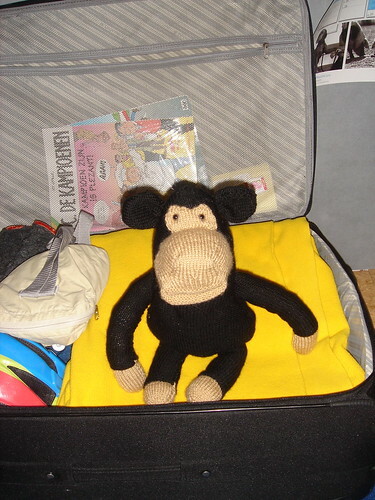 That’s a long time when you know that I never had to miss him for more than half a day… So this knitted monkee is gonna be a surprise in his suitcase. I hope he’s gonna like him. And I hope this knitted monkey is gonna help him not being homesick! Ik lees graag de blog van monkeemaker. Mijn zoon kijkt dan soms mee en vroeg me ooit eens om zo een gebreide aap voor hem te maken. Nu, vele weken later, is hij klaar. Net op tijd wat morgen vertrekt mijn zoontje voor 5 dagen op sportklassen. 5 dagen!!! Ik heb hem nooit langer dan één dag moeten missen. Het zullen 5 erg lange dagen worden..
Maar mijn gebreide aap is net op tijd klaar en kan stiekem mee in zijn valies. Ik hoop dat hij ‘m leuk gaat vinden en dat hij ons door deze zotte aap niet ál te hard zal missen! 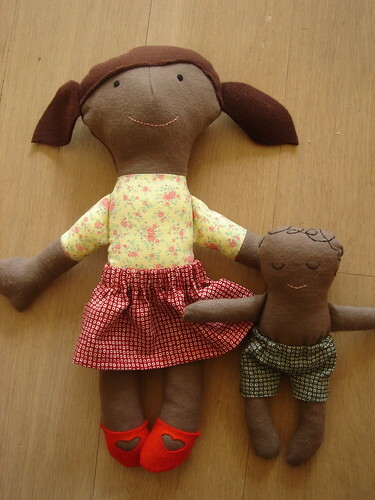 My son is taking over my blog, he’s been more productive than me: last weekend he made 2 bears (the brown and the white) and I only made one doll…This was a special request from my daughter: a lady with high heels! I think she’s quiet fancy, perhaps a new kind of a doll for the shop? What do you think? But hey, it’s your last chance for commenting on THIS POST for the give-away! Hurry up, tonight I’ll draw 3 names! Here’s the newest softie from ‘tante hilde’. And once again for this robot I used my very last label. I have sewed a good 100 items in one month!! Like I said, I’ve been very busy: I sewed 150 Christmas tree decorations, 4 sets of the ‘crib’ (including the Virgin Mary, Joseph, Baby Jesus, the shepherd, 2 sheep and 3 kings), 16 brown mice, 4 little gnomes, 4 fabric baskets, 17 children’s aprons, 33 bibs, 8 baby fleece blankets, 7 children’s fleece hats, 6 sets of 6 table-mats, 8 handbags, 3 make-up bags, 10 tissue pockets, 5 key chains… and one robot. Now, does that make a hundred? I hope that’s enough for my very first craft-fair next weekend… Tomorrow my sister is coming by to help me set up my stall… Pictures will follow! Today this sweet clangclang rabbit arrived! My mermaid arrived a few days ago at her place!